Title: What Would Mr. Darcy Do? Abagail Reynolds is one of my favorite authors when in comes to Pride and Prejudice variations. I have read several of her novels and have fallen in love with each one. She takes the question 'what if?' and applies them to the original story line. 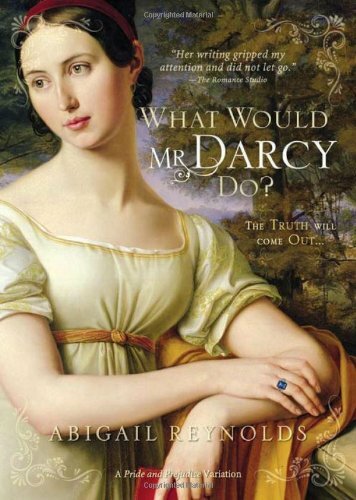 In this novel, What Would Mr. Darcy Do? Abagail Reynolds addressed the question, What if Mr. Darcy and Elizabeth Bennett were upfront with their feelings for each other at the Lampton Inn?" The storyline takes off in a new direction. Elizabeth and Mr. Darcy both confess to their romantic feelings towards each other and things start to heat up. They are caught in a precarious position by the Gardiners and hard choices have to be made. Although Elizabeth is fond of Mr. Darcy, she does not want to be forced into marriage. Mr. Darcy makes it his mission in life to convince Elizabeth that he is the right man for her. This book was originally published in 2008 under the title, From Lambton to Longbourn. However this was my first time reading this particular variation. I found the story line to be very enjoyable. I like this twist on the original story. I also like that Abagail Reynolds keeps most of the side stories in tact while giving us something completely new. She stays true to the characters and their personalities. Mr. Darcy and Elizabeth both express doubts and misinterpret each other quite a bit. They must learn to overcome it their insecurities, with the help of the Gardiners. Things also become a little hot and steamy between the two. It's not R rated but definitely not PG either. The chemistry between Elizabeth and Mr. Darcy is captivating. Overall this book is a great Pride and Prejudice variation. I adore Abagail Reynolds and I love reading her novels. She definitely gives me my Mr. Darcy fix. If you're a fan of Pride and Prejudice, I would recommend this novel to you. Even if you're not a fan it's still a good read. *I received a copy from the publishers in exchange for a fair review.